Video: Your Team Is Here! In this short video, students talk about why they love being a fan at a Falcon soccer game, running in the Hues of SPU Run, and playing intramural sports. As one student says, "we pretty much have something going on every single day." Step inside some of our favorite places on campus — and explore the action from every angle. A professor and an alumna discuss the ways nature intersects with faith and Christian practices. Learn how students are stepping out in faith after participating in “Immerse,” a new School of Theology program for students in grades 9-11. Check out the seven new business certificates for working professionals. Gain new skills in just two quarters. Tour campus, visit classes, talk to students and professors. Arrange an official visit and get a Visit Scholarship! To receive your best possible financial aid offer, submit your FAFSA for the 2018–19 academic year as soon as possible. Choose from 69 majors and 55 minors. Find the program that helps you reach your goals and make a difference in the world. More than 250 families are on campus for a two-day event which includes attending classes, meeting with professors and current students, eating in our award-winning dining hall, and exploring Seattle. Sign up for the next admitted student event on April 19-20. The Danny Helseth Project presents an evening of groove-oriented chamber music on Saturday, April 7, 7:30 p.m. in Nickerson Studios. The event will be livestreamed. Beginning Autumn Quarter 2018, the library will offer a new minor in information studies. Learn more about this program at an upcoming event on Friday, April 13. Find out everything you need to know for this year’s graduation exercises. As national demographics shift toward increasing diversity in cities and local communities, the Church faces numerous challenges and opportunities. Church leaders, community members, and students are invited to this one-day interactive conference hosted by Seattle Pacific Seminary featuring leaders in Christian reconciliation, community development, and missional theology. This special event features discussions from experts and families living with autism and a resource fair to connect individuals who have ASD and their families with community programs in Washington state. This new digital publication features stories written about and by Seattle Pacific students, faculty, staff, and alumni. Scout Cai, named the NCAA Division II West Region Field Athlete of the Year, placed an All-American fifth in the women's pentathlon at the indoor track and field championships. Seattle Pacific recently signed memorandums of understanding with several Asian universities and education organizations to explore academic partnerships. This extraordinary man of faith who engaged the culture with the gospel of Jesus Christ and truly changed the world received an honorary doctorate from Seattle Pacific in 1954. Alumnus David Boxley ’74, a nationally recognized totem pole carver and a culture-bearer of the Tsimshian indigenous people of southern Alaska, received the Medallion Award from Seattle Pacific. Learn more about David and his work in this short video. Our former neighbors, Tent City 3, are featured in today's New York Times. The story profiles several TC3 residents during their recent stay on our campus, and looks at the problem of homelessness in the Seattle area. 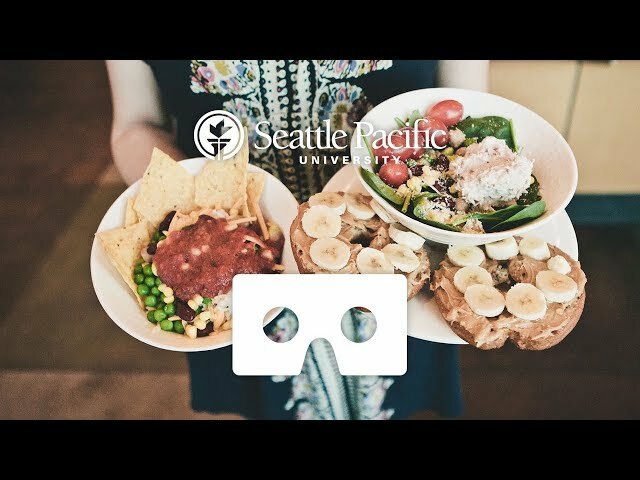 Get a 360-degree look at life at SPU. Step inside a residence hall room – and imagine how you’d decorate and personalize your room to make it your own. Sit in on a group worship service. Join us for dinner in the award-winning dining hall, Gwinn Commons.